Here's a shout out to all the golfers in Tallahassee who are thinking about making a move. Today's housing report on Golden Eagle Plantation in Killearn Lakes provides ample evidence that you can practically play for free based upon the current savings available in this hot NE Tallahassee neighborhood. First things first (after all, who would want to play for free without even knowing anything about the quality of the golf course and the neighborhood). Talk to the better links lovers in Tallahassee and you'll quickly discover their favorite course here is Golden Eagle. It's a Tom Fazio design that he once listed as one of his best works, and it provides all the challenges you need from scratch golfer to the upper handicaps. Golden Eagle is also Tallahassee's only gated, golf-course community, so if you are looking for the country club lifestyle, this neighborhood must be on your shopping list. Now as far a "practically playing for free," consider that current prices are about $100,000 cheaper than they were ten years ago (when the same number of homes sold as you'll see were sold last year). So consider $100,000 will pay your membership fees for quite a few years, I consider this "practically" playing for free. Home values will return, you might as well be playing some golf while you wait, right? Today's report on the housing market in Golden Eagle includes average home price trends, home value trends, and home size trends. 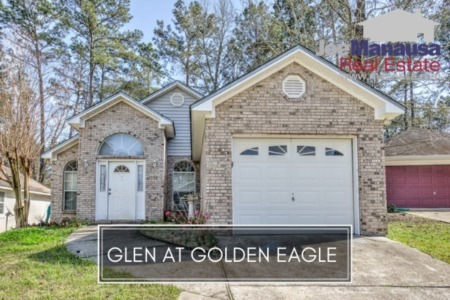 Additionally, we map and list all Golden Eagle homes currently listed for sale in the Tallahassee MLS and provide a table of every past home sale going back to 1991. The narrative contained below is for sales through December for all years, but the graphs and the closed sales table will be continuously updated into the future (meaning bookmark this page if you always want to know the current status of homes in Golden Eagle Plantation). Average home prices rose 4% in 2015 versus 2014, representing the second consecutive year of rising prices. This means that current home prices sit roughly 20% below the peak of the market prices established in 2007 (ignoring the one atypically large sale in 2009). The average recorded sales price was $469,500 for Golden Eagle Plantation in 2015. Home sales activity in 2015 was very good. When looking back 25 years and counting the number of homes sold each year, 2015 finished as the 9th best year during that time span. 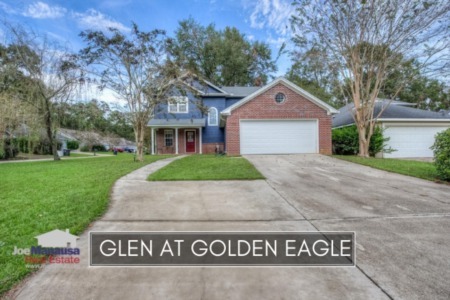 In 2015, there were 48 closed home sales in Golden Eagle Plantation. Golden Eagle Plantation home values were the same in 2015 as they were in 2014, meaning sellers did not get more money just because average home prices increased. The average value of a home sold in Golden Eagle Plantation was $139 per square foot. This is up nearly 9% over the bottom reached in 2013, but still down about 22% from the market high set back in 2006. This means that many homeowners who have purchased or refinanced in the past 10 years could owe more on their homes than they could get with a sale today. The average home size sold in Golden Eagle Plantation typically falls in a range of 3,000 to 3,500 square feet, and buyers in 2015 selected homes very near the middle of this range. The 48 homes sold in 2015 averaged 3,335 square feet. The following list shows home sales in Golden Eagle Plantation going back to 1991. I hope you enjoyed our January 2016 update on home sales in Golden Eagle Plantation, please feel free to drop me a note if you have questions not covered in this report.